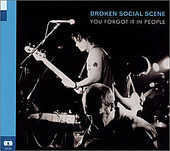 A candidate for album of the year (and a likely choice for winner, too), Toronto, Canada's Broken Social Scene, and their sophomore release, You Forgot It In People (Arts & Crafts), deliver a truly divine experience, putting other atmospheric and mood-oriented albums to shame. At the helm of this 10-piece collective is Kevin Drew and Brendan Canning, whose friends Jason Collett, Andrew Whiteman, Justin Peroff, Leslie Feist, Charles Spearin, Evan Cranley (Stars), James Shaw, and Emily Haines (Metric) joined to fill out the line-up. Together, the band creates a masterpiece in You Forgot It In People, a sprawling record of layered instrumentation that nestle well alongside airy melodies, swimming vocals that breathe with the same life as the more instrumental tracks, and primal beats that charter their own course alongside their lush counterparts. "Anthems for a Seventeen Year-Old Girl", with Emily Haines on vocals, starts off with a few banjo plucks before light percussion come in. Then Haines' voice creeps in, with the rest of the airy, alluring instrumentation reeling you in. From there Haines' recollection of "one of the rotten ones" that she "liked for that" who is "all gone-- got your make-up on-- and you're not coming back" has you sitting on the edge of your seat as you re-live the bittersweet memories with you, the subtle orchestration courtesy of the strings bringing you to a sensitive state of mind, while the precious banjo helps you keep it together, bringing to light the good memories. All the while Haines' vocals comforting you, as if you're the one that has lost something once close to you, not her, and she is there to help you feel that void with good music and good conversation. And, though a song like "Anthems for a Seventeen Year-Old Girl" may bring to mind thoughts of melancholy and bittersweet celebration, the Kevin Drew-led "Cause = Time", with its bouncy, quirky pop touch and slightly dark indie-rock, guitar-driven noise with primal beats pushing it along, offers the high-energy, pulse-stopping, yet still subdued reaction for you to keep things from going to far into bittersweet memory lane. That's not to say "Cause = Time" is lightweight or void of subject matter, as it certainly is not, nor are any tracks on this album. It is to say, though, that with ten people in the band, and two main people helping drive the ideas, that the album is bound to diversify, often times each track straying down a different path than the previous one, and somehow, somewhere, later in the album coming together to jog your mind and let you know just how every piece of the puzzle fits together. If you look at it from an album standpoint, the light at the end of the tunnel is blinding, and things become clear. Play it all the way through, on the headphones, and after you're done crying -- both due to sadness and sheer joy from the pleasure of listening to this album -- then you will comprehend the depths at which this album reaches, emotionally and musically. Whether they're treading instrumental waters or forging ahead with post-punk/indie-rock leaning nuggets. Drafting atmospheric songs that are more cerebral than upfront, or blending all their ideas into a melting pop of somber, bouncy, dark, enlightened indie rock ecstasy that both gives you a hook to enjoy and a cerebral attack to play with the mind. The band always excel, and never fails to excite. You Forgot It In People is a mind-blowing, equally experimental and indie-rock leaning record that defies convention while embracing tradition. And for that Broken Social Scene should be heralded as one of the best bands on the planet. Period. I'll give it an A+.